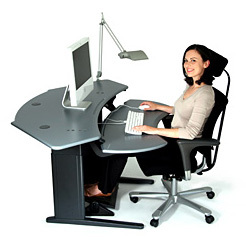 A linear, dual surface desk series with motorized sit-to-standing adjustment with 3 presets and digital read-out. This is a premium, heavy-duty design featuring our trademark solid surfaces and Comfort Edges. The keyboard surface offers separate, instant spring-loaded adjustment with positive and negative tilt option. Black frame as standard, Maple version has silver fame. Available in several sizes for multiple configurations, and is Ideal for office, commercial and professional applications. Call us now for free color samples at 888-302-DESK. 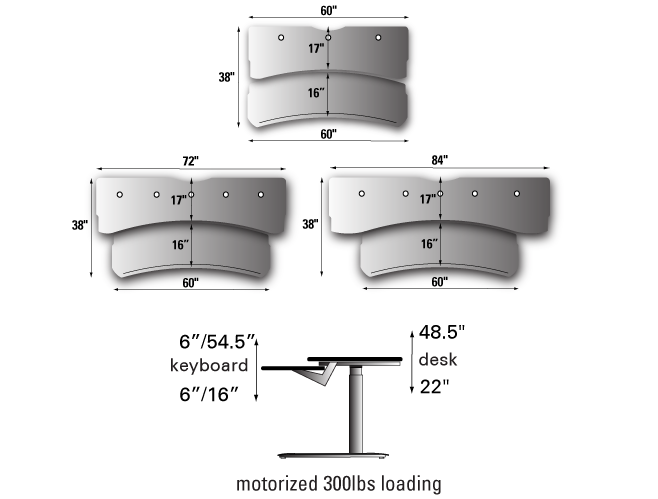 Highest sit-to-stand operation: Keyboard surface 16" - 54.5", Monitor surface 22" - 48.5"
• Instantly height-adjustable motorized frame with 300lb loadin, 3 position height memory and soft start and stop. 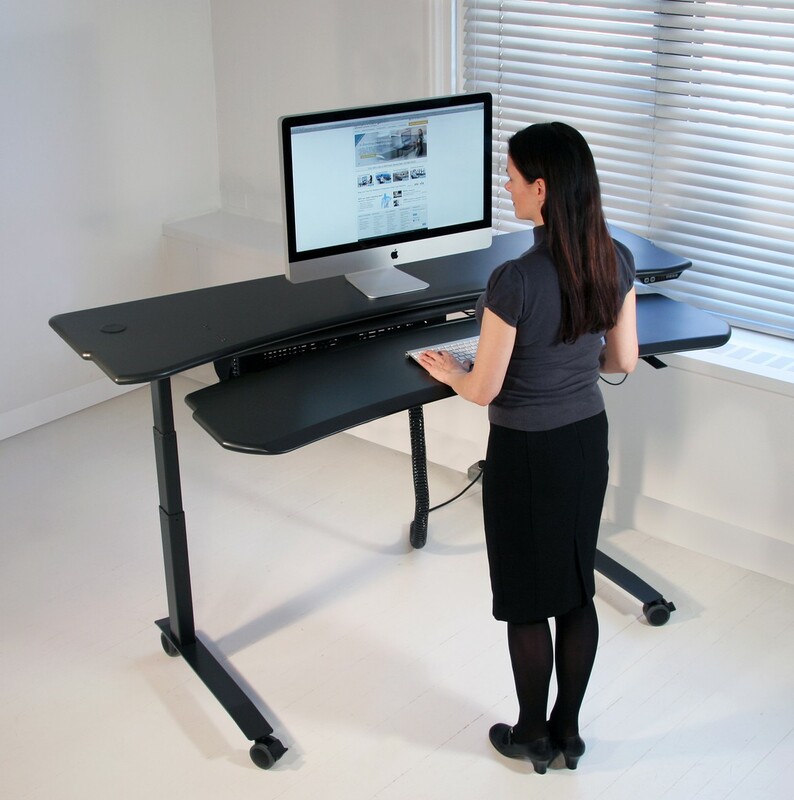 Because biomorph desks are stand- alone units and can be fully mobile, they can be re-configured at a moments notice, requiring minimal installation and virtually no maintenance. The nine basic biomorph models represent a starting point from which to grow a highly flexible work environment that maximizes floor space and user needs, by combining them with biomorph extension worksurfaces and storage options. Most models can be neatly placed in a corner, angled to a wall or grouped in quads to facilitate flexible workgroups. Shipping of stocked items is 3-6 weeks from receipt of order to ship from factories, 4-6 weeks for chairs and lighting, sometimes less depending on locations, plus travel time. For larger (20+ units), out of stock, customized orders or special colors, the shipping time is 6-8 weeks. Accelerated and international shipping is available.Please call us at (888) 302-DESK or email us a tinfo@Biomorphdesk.com for further information. In all cases products are covered by limited manufacturer's warranties that warrant the products against defects in manufacturing, whitch measns that if a product is not manufactured correctly and any part of it is proven to be defective then it will be repaired or replaced, depending on the stated conditions. Biomorph will facilitate troubleshooting and warranty support to the best of our means, and sometimes the manufacturer will provisde this directly. In addition, all shipments are covered by the carriers when in transit, so any damage that occurs during shipping is their responsibility. However, it is vitally important that the freight damage claim procedures are followed ( see below). Either way, we sell high quality, fully supported products that will please for years to come and that can be purchased with complete confidence. 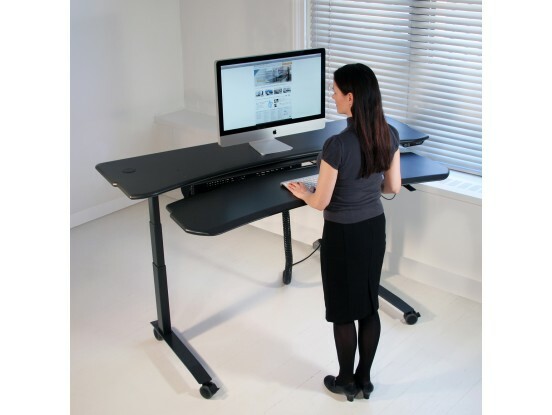 Biomorph utilizes frame components from several manufacturers, depending on desk model. Biomorph also sells chairs, add-ons and other items as a preferred reseller for established quality brands including Humanscale, Waldmann, HAG, SIS and others, and these manufacturer's warranties will apply in all cases. IN ALL CASES CLAIMS MUST BE MADE WITHIN 7 DAYS OF RECEIPT OF GOODS. SIS-USA inc. Warranty for frame components. Seller warrants to the original Purchaser only that the Products Seller manufactures and sells to Purchaser are free of defects in workmanship and materials, during the applicable warranty period set forth below. Warranty period set forth below for is for 24-hour, 7 days a week, multi shift use. Should any failure to conform with this limited warranty appear to a Product listed below during the applicable warranty period from the date of shipment, Seller shall, upon prompt written notice, repair or replace, at its option and costs, the affected part or parts. Damage caused by a carrier other than the Seller. Normal wear and tear or acts or omissions of parties other than Seller (including user modification). COM/COL or other third party materials applied to Products. Products not installed by or under the auspices of a certified dealer of Seller. Dramatic temperature variations or exposure to unusual conditions. No freight damage or shortage claims may be made after 7 days from receipt. No merchandise may be returned without written consent of Ground Support Equipment (U.S.) Ltd. DBA Biomorph in the form of a return goods authorization and shipping instructions. Parts are only returnable if damaged or incorrect, otherwise a restocking fee applies as follows: Assembled desks with original packing materials – 50% of net invoice price plus round trip freight charges; Opened unassembled parts with original packing materials – 35% of net invoice price plus round trip freight charges; Unopened packaging – 25% of net invoice price plus round trip freight charges. Refunds will be made after receipt and inspection of goods in our warehouse. No merchandise is to be sent to the New York City address without prior written consent. Any unauthorized shipments will be refused and returned at the owners expense. Orders for custom and non-standard products are not cancelable. Post shipment pre-delivery cancellation incur return & restocking charges. Shipments held over 15 days incur storage charges. Original manufacturer terms & conditions apply to non-Biomorph products sold under dealership.